Dasychira species Sulawesi | Welcome, visitor! Dasychira is a genus of Lymantriidae moths that has over 90 species(!). They can be found all over the world, including Australia, America, Africa and Asia. Not much is known about them, especially not of the tropical species. A female of Dasychira dangling by a single leg; ready to spawn hundreds of eggs. 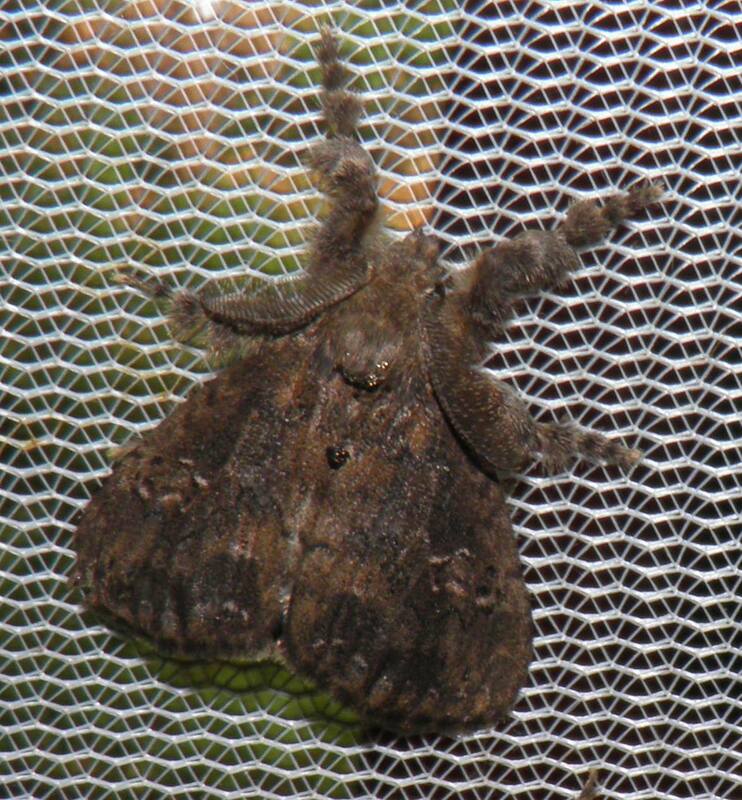 Special notes: Not much is known about the biology of this moth in the wild. Devours literally everything. Causes terrible rashes. This story begins with somebody that traveled to Sulawesi (I guess I will not mention your name in public, but thank you!) 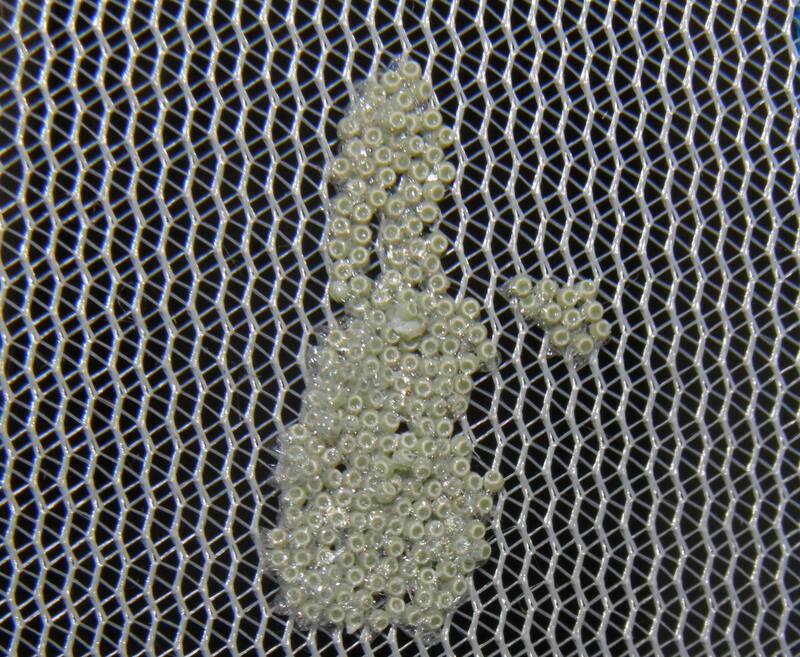 and collected eggs of a small moth that had laid eggs. It turns out that this unidentified species of Dasychira was really easy to breed. I had obtained them as young larvae. I was told to feed them dandelion (Taxaracum) but quickly found out they ate many other things; in fact nearly everything. 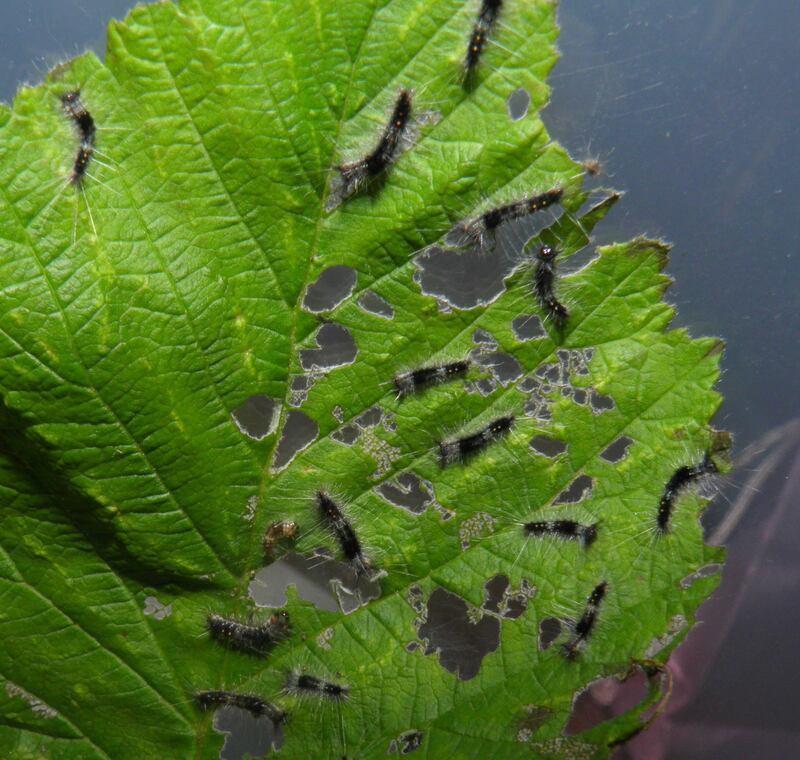 I reared the first few instars on raspberry plant (Rubus idaeus) and sleeved the older mature larvae on my cherry tree (Prunus avium). The larvae of this Sulawesian Dasychira seem to be more solitary in nature although they tolerate feeding in high densities very well. I have reared nearly all of them without a single loss. It is one of the most powerful species in captivity I have ever witnessed, quickly eating nearly any kind of food you throw at them and developing to adults in two months time, only to start the cycle all over again. So what why that introduction, you wonder? Well, as the larvae grew older, it turns out they are living bioweapons. The larvae, in fact, are covered with numerous irritating hairs that disperse through the air. This is nothing new, but these seemed to be very potent. My body was covered with rashes for days, that did not really hurt, but rather itched and burned to the point of nearly driving me to insanity. Even multiple cold showers could not help me from this feeling, and even the clothing I used to wear when cleaning out their sleeves and cages had to be thrown into the washing machine since the tiny hairs remained embedded in my clothing. At some point I even considered giving up, something that is very rare for me since my passion for moths usually drives me to the point of obsession. 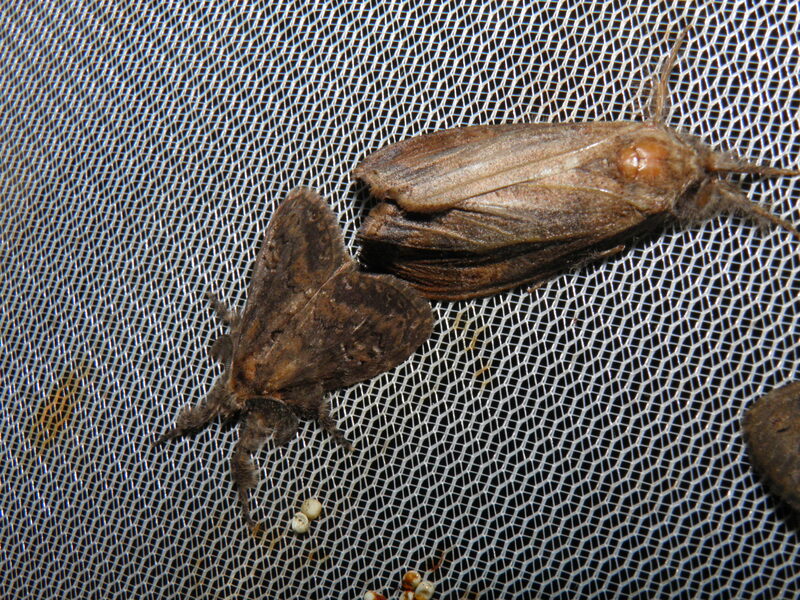 But I didn’t and atleast I got to record the life cycle of this mysterious moth. Despite experiencing what I could only describe as relentless torture for weeks, after religiously cleaning their containers and hoping they would pupate soon, I did grow to like this mysterious species. Their habits are interesting. If startled, the larvae curl up into a ball or either run away with a velocity you would not expect from a caterpillar. It was also interesting to study how polyphagous they were. It seems they ate nearly everything I was able to offer them, accepting even random plants like Buddleia, Robinia, and all Rosaceae I could find. I wonder what ecological disaster such a species would be if they managed to escape, if not for the fact these tropical moths would never survive the cold European winters – they could devour nearly everything. 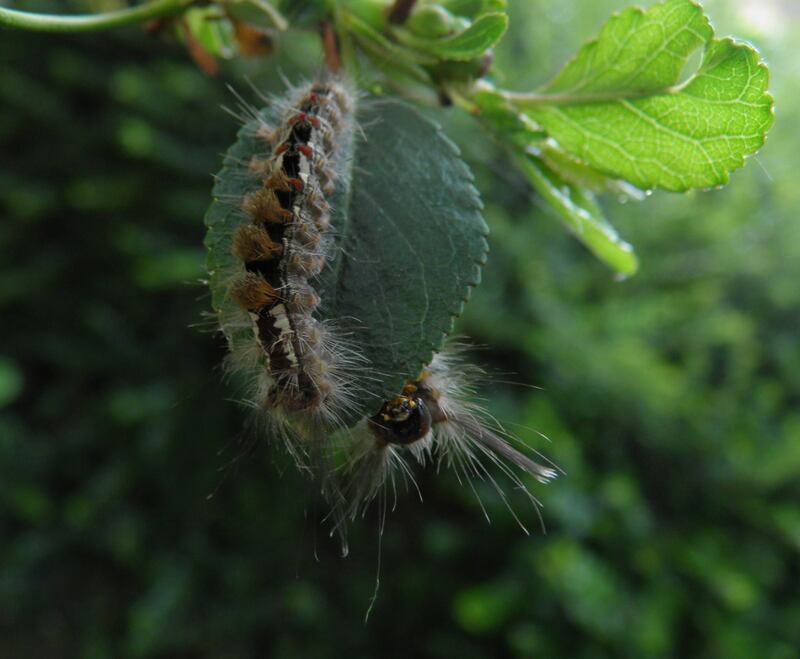 The larvae have large tufts near their head that they rub against a gland located on their behind, covering them with venom/irritating substance from the gland. After rearing them for about one month time the larvae become fully grown and started spinning cocoons. They left a nice suprise for me; when pupating, they discard all their toxic hairs and incorporate them into the silk. 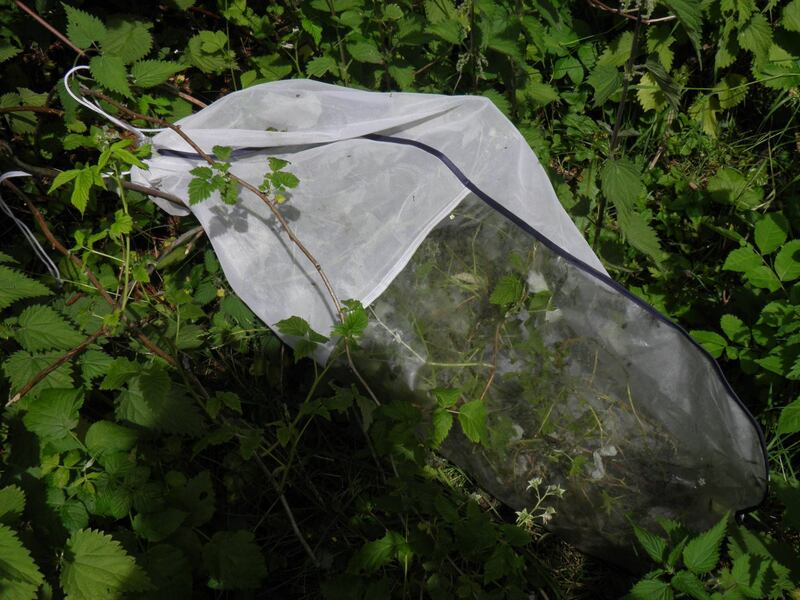 I had to throw away the rearing sleeve I used to raise over a 100 larvae to cocoons (after collecting the cocoons, of course) for its insides were coated with a mixture of silk and hairs that would disperse everywhere. 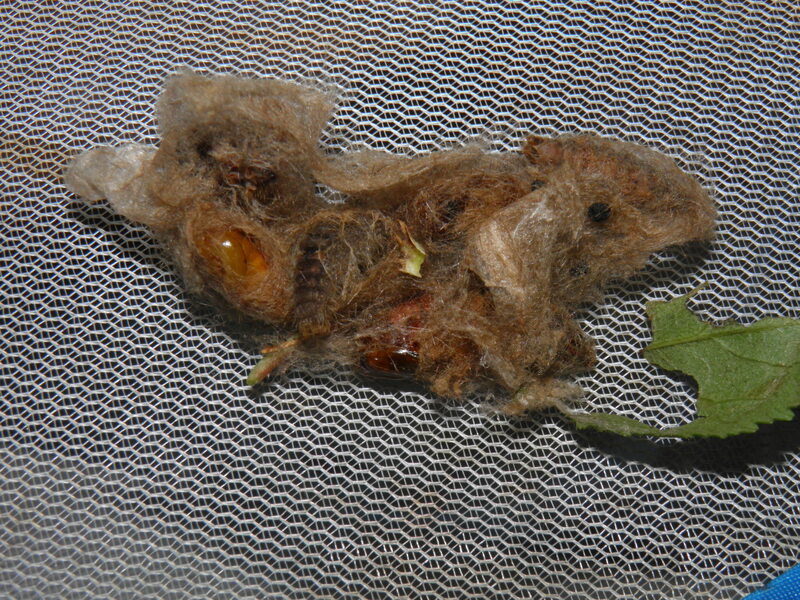 Cocoons and prepupae covered in hairs and silk; Dasychira sp. 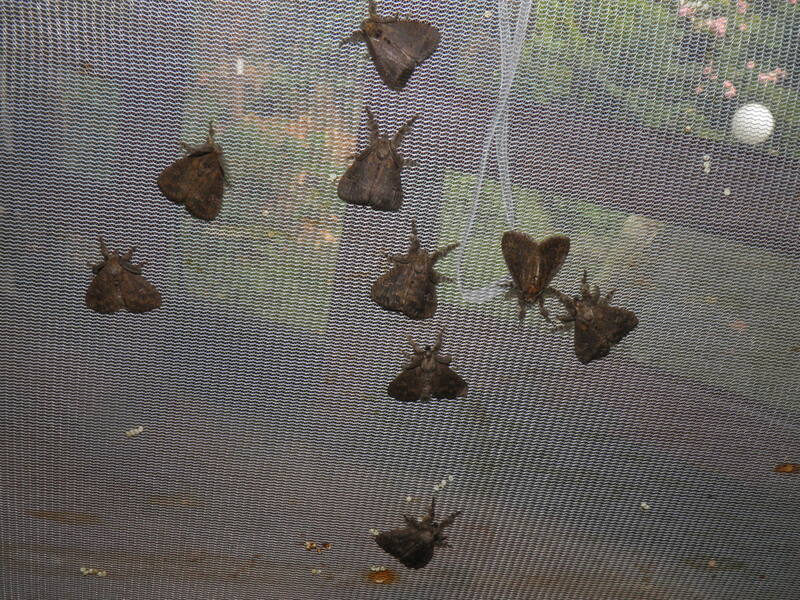 Adult moths started hatching after about one month. While not very spectacular looking, their appearance is interesting, and they reminded me of “bunnies” with their hairy spider like legs and big antennae. The males hatched one week before the larger females. The males seem to be smaller, more active, and have a dark brown colour while the females are bigger, plump, and seem have a lighter yellow/brown sand like colour. The adults seem to be easy to pair, while interestingly, I have failed to observe any pairings. This suggests they pair for a short while, although I did observe males and females in a close vincinity to eachother in the morning, suggesting they had paired at night. Males will appear shortly before the females, synchronising their lifespan, although the earliest of males will get no chance to pair, for their lifespan is quite short (a few days to a week). 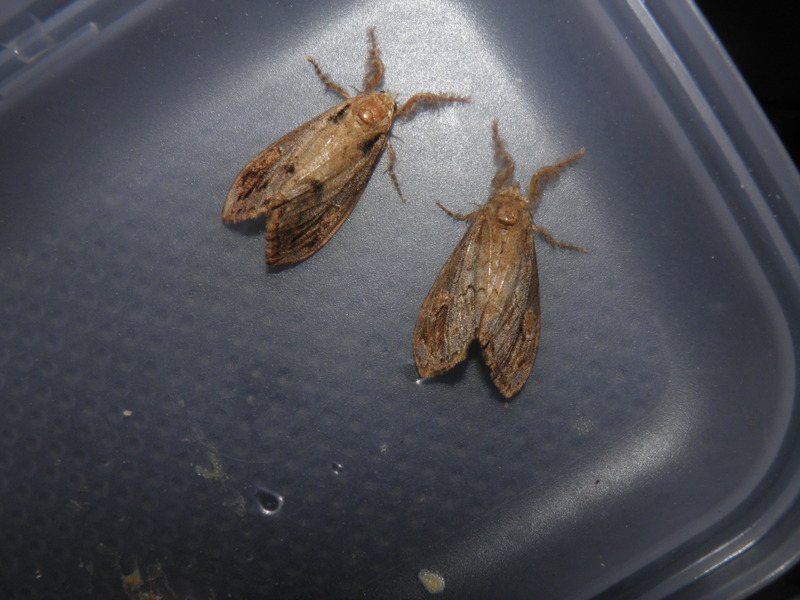 It took a month between pupation and the first adults to appear in captivity on room temperature. 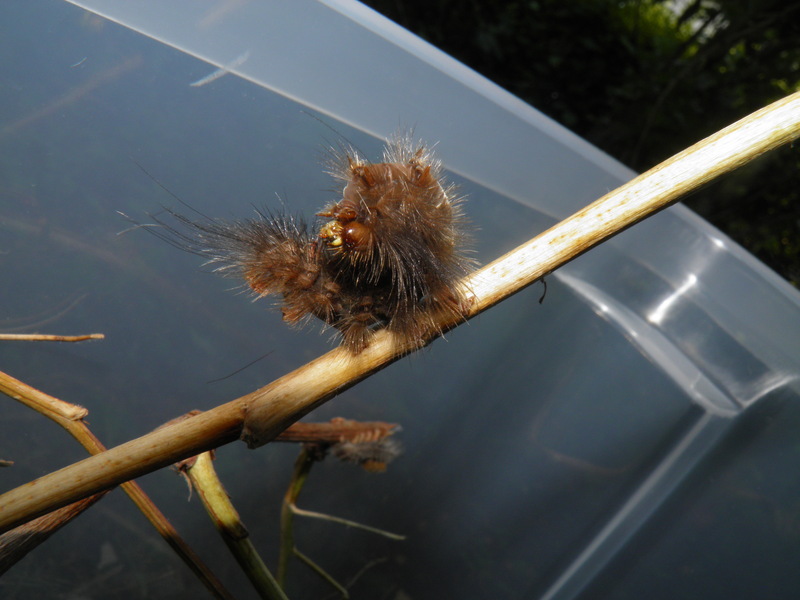 Also interesting to see were their pupae and eggs. 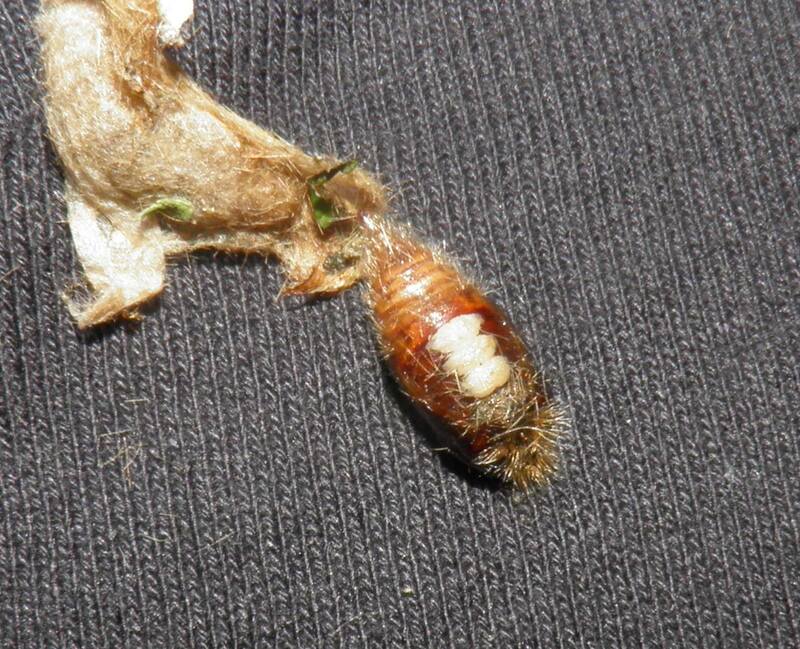 The thoracical segments of the pupa each have a white patch on the backside; possibly the location of the three big tufts of hair on their backs (as larvae). The eggs are interesting too, for they seem to be coated by what can only be described to look like “plastic foil” – when the eggs are laid, the female seems to excessively cover them with a substance that quickly hardens and both acts as “glue” holding the eggs together and attaching them to a surface, but also providing them protection. Eggs hatch quickly in just a few weeks time. All in all, breeding these was a very interesting experience, and the only regret I have is not obtaining a DNA analysis to find out what species it may have been. 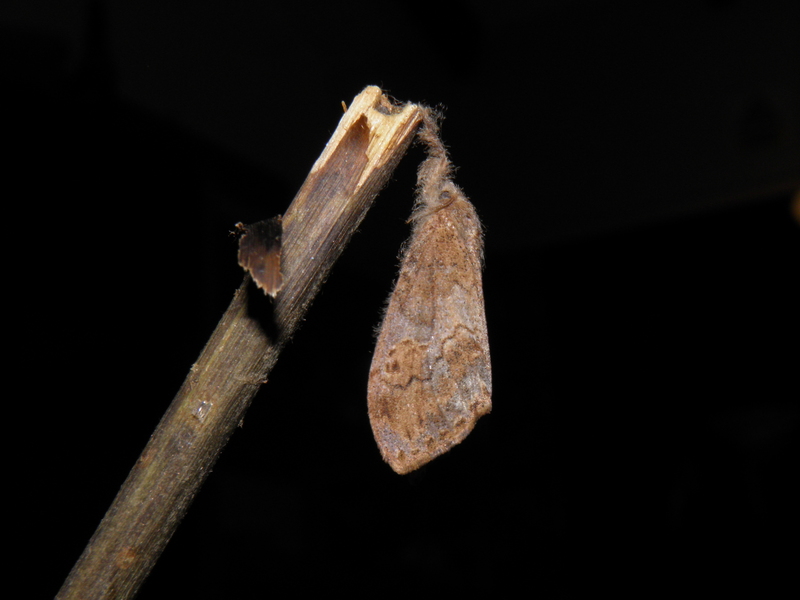 In fact, in theory it could even have been a new species, although unlikely – but the fact remains that such species of moths are not well studied, especially from locations like Sulawesi island, that has many endemics. It would have made for an interesting scientific publication describing their life cycle (or the species) – although the latter would not have been very viable, since they were collected by somebody else, not me. Maybe some day, somebody reading this website will have a clue what they are and hopefully contact me with the correct species identification. Normally when I get to breed something with scientific interest, I pull through to the end to try and find out what they are, and to describe it if they are unknown. But I guess in this case I was greatly discouraged by the burning, irritant hairs, definitely not wanting to raise another generation, although interesting to see. I’m sure that I could, and would have bred a thousand if not for that fact. Moths and Butterflies of Europe and North Africa One of the best and most user friendly websites available about the European Lepidoptera; contains hundreds of species with pictures and information. Pyrgus.de A very comprehensive website with pictures and information on over 1500 species of European Lepidoptera. Useful for studying European moth species and their faunistics. Recommended.